The following story was submitted by one of our readers. She has endured many years of being married to her alcoholic husband. Currently she is seeing more clearly how the alcoholism is ruining her marriage and life. “K” is unhappy, confused and doesn’t know if she loves him anymore. Please feel free to leave your comments below the article. My story is very confusing to me. That is why I am submitting it for your perspective. I met my husband 22 years ago. He was 18 and I was 22. At first he seemed to always be the party guy and I accepted that…everything seemed fun and magical. We were living in another country at the time and were convinced to visit the states to check on my very sickly mother. They would have a place for us to work, then we could save up and go back to Europe where he is from. Needless to say my mother was fine, and “NO” job existed. We became stuck. It was suggested that he marry me (neither of us were into marriage). The idea was that if we got married he could stay in the country, find work and we could save on our own, with the intention to leave again. Okay, so we did that. It took years to save money to reach our goal of leaving and in that time he appeared to drink on a regular basis, but I did not pay too much attention. It did seem that I was the one who worked more and he was the public relations guy who seemed to have all the fun. Ok, 10 years pass, I break up with him. It was hard because everyone was on his side. He went into some drunken grief over me leaving, apparently tried to kill himself then went missing. His friends even started posting signs that read, “missing person”. It was horrible. I managed to be away from him for about 8 months. I tried to stay with family, but they were difficult. He began to call me all the time attempting to work things out. I finally decided to give it another try and moved back to his state 15 hours away. So we both got 2 jobs, saved money and moved back to Europe. But…members of his family are raving alcoholics with some anger issues. So, we decided to go with plan b. We moved to Hawaii. For some reason everything fell into place for housing, jobs and school. We got into a regular work and school routine. However, this whole time he was drinking every night, about 40 oz or more was his routine. For some reason I did not consider it alcoholism because it was only at night after 9 PM. Then about 3 years later his routine turned into walking to store at 9 PM then going into his office, shutting the door, drinking and smoking cigars. Then he would either fall asleep with face on then computer, sitting up on toilet or on the couch. I think he basically stopped sleeping in the same bed as me and I began to feel very sad. When I would discuss it with him he would blow it off. When I would ask him not to walk to the store and to take a break from drinking, he would tell me he does not have a problem because he has seen crazy alcoholics (his parents) and he’s not like them. In 2008 we had a daughter. I had him sign a contract with me that we would limit his nightly drinking to weekends. He agreed, but did not follow through. He also go into a graduate college program in 2011 that allowed him to have his own art studio which he could use 24 hours a day, all week. So at first for a year he began leaving at 9 PM for his beer but then meeting up with friends and not coming home until 2,3,5,or 6. I finally told him after 1 year, if he could not be home by midnight, stay at the studio so I know he will be safe. So he would stay at the studio, come home at 6 AM and help get our daughter ready for school, make food, use the shower and appear as if he lived there, then leave at 9 PM. So the crazy hours of coming home stopped. This went on for 3.5 years. The whole time we needed to depend on each other financially. I worked more then him and tended to be the one to take care of everything. Okay, so after trying everything to cope with this confusion (yoga, karate, walking everyday, being super busy), I still felt so depressed and stuck. Family for some reason saw me as not being understanding or trying hard enough. I was so stuck. So one day after our tax return arrived I bought plane tickets to visit my family with out asking him (of course I bought one for him). It was intended to be for a 3 month visit just to regroup and get away, besides he was suppose to graduate that Spring. Right after I bought the tickets there was a sudden complication with his department and they decided he needed to stay a year longer. There was a lot of anger and confusion and I tried to help out. Needless to say, our 3 month visit turned into a move to a state I really don’t want to be in. My husband is happy to be away from his school concerns and has a job he loves. However, every night at 9 PM he takes his walk up to a store and gets his beer. I feel like I am not sure what to do. Nothing seems to have changed except our location (which is too cold for me and too close to family). He is a nice guy. Everyone loves him, but over the years I can tell that at a certain hour he gets grouchy and yells more if his routine is disrupted. I feel like he is the only person in our relationship that attends social events because I seem to be the busy one. I thought moving would help change my feelings towards him, but I feel numb and unable to connect like we used to. I am not sure how I love him anymore. Besides, he tells me that I am to sensitive and the amount he drinks 7 nights a week is not a lot compared to others. Am I too sensitive? I just feel that this alcoholism situation is only going to progress and not change. What I say to him does not seem to matter. JC: K, thanks for submitting your story. I do hope that after writing all of this out that you can see more clearly what you have been living in for such a long time. I feel like the last three paragraphs of your story are the most important. Why? They address where you are presently, unhappy, confused, feeling unloved and out of love, isolated, doubting yourself and aware that nothing has changed after you’ve endured so many years of your husband drinking. What do you want to do K? Hi Kay! Wow! Your story sounds a lot like my own: We’re both “sitting on the fence” about our marriages. I’ve been married 18 years, and in the beginning we partied together. My husband has never been physically abusive to me (except when he yells at me). He is a smart and hard working man every day, only drinks at home, after work. He doesn’t want to jeopardize the nice life we’ve been building together all these years, and neither do I. However, his drinking has escalated from occasional binges to nightly drinking and he can drink a Litre of Vodka in a week or less, plus many beers. After work, the scenarios alternate: 1) He watches the tube and ignores me. 2) He is sickeningly sweet & insincere. 3) He is wasted, falls down and hurts himself, which is the scariest. We’ve not had a vacation or fun activity together in 10 years +. We have a business, and over time, he’s put more of the workload on me. Tasks that used to be shared are now on my plate. He doesn’t see this, and gets angry with me when he cares to notice how behind I am. I could be at my desk 24-7 and it would take many days to catch up. I alternate between spending long days and sleepless nights trying to catch up, with getting the heck out of here/rebelling. I have a right to spend some time with friends, or doing activities that bring me joy. When I come home, I’m often asked “Do you love me?”, “Do you want a divorce?” I’m thinking about that, but have not decided and don’t want to “jump the gun”. I refuse to make love to someone who is drunk (the smell alone is deterrent), and we’ve been sleeping separately for 6 months or so. We’ve had conversations about this, and I told him why, but he just says “I like getting high” and “I’m not going to stop drinking”. We haven’t had a vacation or a fun activity outside our home in over 10 years! THANK GOD, I found Al Anon a year ago, and I now have hope and a plan to grow my future! I grew up in an addicted household, and I can finally heal from my sad upbringing to become the happier & healthier person I want to be! I do not have to be “stuck” in a sad, loveless relationship, just because of $. Sharing with others like myself is so uplifting and beneficial. My spouse and I both have the same choice, to grow or not. My plan is to continue recovery with Al Anon, complete my work backlog, while finding ways to give some of my work back to my spouse. When I’ve caught up I will take a job outside the home. I’ve been telling my spouse that working together is killing our marriage, but he doesn’t admit it. Taking this step could improve our marriage or implode it, but I will know if I want to stay together or not. It’s scary to think of throwing away all we’ve built, but as they say, a house built on sand will not last! I feel that I’ve been sinking for a long time, and I’ve got to save myself! GOD gives me unconditional Love, the Courage to continue, the Patience to go the long run, and the Serenity to be at peace through it all. Hi K! I meant to say: God give me the Courage to act when needed! I forgot to say: I’ll pray for both of us to find our way to health & happiness. I want to add: Our hearts will know, will tell us what is best for us. Kay: Sure hope you have gotten support from a friend or family during this difficult time. Sometimes there is no one to turn to because there really isn’t an easy answer when someone is drinking and it causes family or a relationship crisis. I have been through the leaving and then returning to find the situation becomes worse. There may be an excellent therapist in your area who has dealt with the affects of an alcoholic in a family. Not everyone is trained to handle that field – when I went through my divorce, I was lucky to find someone who brought me back to myself. Take good care. Get out and be with people who make you laugh – people who love and support you. C, What were some advices that your therapist gave you to bring you back to yourself? Thanks. It has been a while since the therapy visits. I do remember in the beginning feeling like I was a ghost – I was so closed off from society even in a store! I felt supported by the weekly sessions so I started to speak to people wherever I was. I joined a ski club, went to college at night, found a marvelous job and in time, I was laughing and joining in conversations. A friend told me healing comes in spurts and you can feel like you are going backwards at times. That helped me so much. I have become much more myself since beginning weekly al anon meetings. Have met some wonderful folks there, and they totally understand the strange things that I’ve been through. The feelings can ber very icky inside when it’s stuffed inside. We all help each other to see the rose color in our glasses! Life IS a GIFT! We should LIVe like it IS That! I’ve GOT TO REmemBER, DON’T TAlk Serious with a Drunk!!!!! Makes a fight every time. I hate fighting! I hate yelling. My childhood was filled with Yelling and I thought I’d gotten away from that scenario..
I’ve found several Safe Havens that are working pretty well for me right now: Alanon, Church, and places like this forum, where we can share feelings we’re not able to share with the AH or others in daily life. JUST FOR TODAY, ONE DAY AT A TIME is working very well indeed. My AH is not ready to change his actions, but when I remain detached, I remember that our relationship was formed on the basis of mutual love and respect, and I can feel that these things can and do still exist in our home. I have been discovering many wonderful relationships outside my home, and my inner happiness is steadily returning to me. I make a vow to myself that I will not get “mired in the muck” of anyone else’s dysfunctional issues. I reserve the right to change my mind and my course of action whenever I feel the need to. Thanks to JC and everyone on these pages! My husband relapsed for the 5th time. What really hurts is that we are in counseling to try and fix our marriage and he gets drunks and sleeps with someone all in a course of a week relapsing… what is going on. He went to jail and now he’s sober and sorry. What am I supposed to do? How do i forgive him, how live with this man after what he’s did. He says he loves me and needs me and is truly sorry? I’m sad to hear that your trying so hard to work out your marriage, going to counseling and doing all the healing things, and then your husband relapses and sleeps around. I have not been in that place yet, but if that happens to me, I will draw the line, and make my preparations to move on with my own life. If my husband can’t honor his wedding vow, and instead chooses to put me at risk to catch someone else’s diseases. That means he has no respect for me, and no respect for himself either. I don’t think I could live with that. I think you have some serious thinking to do, and I will pray for you, that you can gather the strength to take care of yourself first! Living with an AH, we always come in second, and we don’t deserve that. Alanon and a good church has saved my soul and brought me back to myself. Patricia, his behavior is totally unacceptable. Don’t put up with this sort of stuff. Get out…Put together a plan to get divorced. He’s a total loser. Do you hear yourself? Forgiving him is just a choice. Forgive him and get out of the marriage. I’m certain this isn’t the man you married, right? Patricia: Your husband seems to be spinning his wheels – doing something and then saying he is sorry thinking he will be forgiven. He is in limbo. The alcohol seems to take over and they cannot think straight. Al-anon is a support group. You need someone to hear the truth of your situation and give you sound professional advice. Actually, it sounds like his behavior is escalating – even though he says he is sober for now. The alcoholic personality remains. Hopefully, none of the women your husband has been with ever come to your home or start calling him constantly. He is taking a chance that could put you in danger. Take good care of yourself. Take a long walk to clear your head and ignore his pretend apologies – it is his behavior that counts not his words. I’m really struggling with what to do. I’m told it’s a disease so then I try to move past the hurt from his drunk actions. I’m finding myself questioning him about the affair a lot and how could allow such infidelity. He says he is very sorry and that he will answer any questions I may have. I am finding myself calling him to see how he’s doing and trying to act like I can move past this but I can’t. I am up one minute with him and then I’m down telling him I can’t do this. He says he wants to stay married and be with me and our two year old. I’m just too tired to care about what he wants anymore. He ends our conversations with I love you, but I can’t say it back. Deep down I feel like I want to hold on to him but then there’s a part of me that’s wants to walk away and never look back. I’m feeling very codependent and broken. I do love my husband but how could I ever love him openly and freely again? I feel like if I leave he will find someone else right away while I would still be alone and heartbroken. I’m afraid of losing him, but I’m tired of feeling the way I do. I have been posting on this site since 2014 and have shared a lot events from my husbands drinking. If you can and feel like it, please read my other post and you will know exactly where I am emotionally. 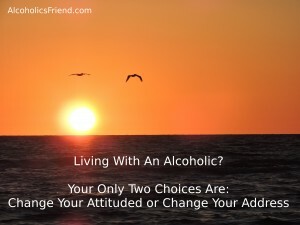 I have posted on just about every topic that talks about coping with alcoholics, blaming, cheating alcoholics etc. Thank you to all that has reached out to me. It really feels good to hear from other points of view. My husband will be 54 on June 5 and I’m 34. We have been together almost 7 years married 2. Wow!Does this sound familiar. I’ve left so many times, then he calls me everyday when I’m gone, and my family is confused. The worst part is how it’s impossible for my family to relate to my partner who drinks, and has been drinking for many, many years. Financially, I have struggled to support myself, with my own health issues it has taken me years to get on my feet. Once I had the surgery I needed, I was able to go back to school and start a great job. Now he is inspired to make a change. But he struggles with his demons and wants to move away to a state that has legal marijuana laws. So there is no peace for me in making a home with this guy. He sleeps too much, and is not working. There is no moving forward with him as much as struggling to keep the wolves away from the door, and keeping my head above water. At 58 years young I feel the change of address would be the key. So that’s what I’m working on right now. Good Luck to you, K, and all my A-Friends. I meant to say I relate to all of this. Not an affair but at least he might leave. The drinking kills feelings and I’m a very fast forgiving person. It’s disappointing and sad and even children don’t influence their behavior. I also haven’t been sure how to get out of it but when it gets bad enough you will. I guilty of having false hope as I see the actions… Not words. Nothing more frustrating. I’m just wondering what happens during the going crazy phase as it looks like this may be going that direction. I keep having the urge to want to tell him how I’m feeling. I’m feeling ok one minute and completely codependent and insecure the next. I want to share with him my every emotion right now but maybe I shouldn’t. Could cause him to relapse again? He said he found the woman he slept with number in his home written on a napkin. I told him to get rid of it he said he was and that he wanted nothing to do with that woman and that it was a drunk thing? I’m just confused. You almost have to leave out of principle, because if you don’t it’s saying in a way that you accept it. Once the precedent is set what is to stop him from doing it again? I hear in your words, a person who is very lonely, I know how that feels. But staying with a person who disregards your feelings so much, keeps you close off from great things that could come your way otherwise. It is very hard to imagine our loved one with another person, while you remain single, but in effect you are already living this kind of torture, and don’t forget whom ever he meets and hooks up with next won’t be living a glamorous life, she will just be walking around in your very same shoes. My advice to you is to imagine a safe happy independent life, detached from the cycle of pain he has you wrapped up in. Picture clearly how you would rather be living even if it means to be single for a while, you need that time to heal. Then work towards making it a reality. So often, we mill around in our misery, and for what? In AA they teach the serenity prayer, well we need it too…accept what you can’t change, change what you can and god willing you can see the difference between them. You only have control over your actions, so try to work within that parameter, and create your own space and life. In other words try not to focus on the awfulness and instead try redirect your mind to how you could make your own choices. Good luck sister, I feel your pain. Patricia, just because alcoholism is a disease doesn’t mean your husband cheating on you is okay. Once trust is broken in a relationship it’s gone. You cannot have a healthy relationship with someone you cannot trust to be faithful. Being concerned about an alcoholic drinking with his buddies is one thing. Being concerned about a spouse being drunk, cheating and getting arrested is just too much worry and anxiety to deal with in my opinion. You have two choices, learn to live in this mess or get out. The big question is always why am I staying in such a dysfunctional relationship? Am I staying because someone is supporting me? Am I staying because of my morals, “never get divorced”? Am I staying because I believe the alcoholic will eventually change? It might be a good idea to find a safe place to write out everything you are feeling and thinking about this relationship. Get everything out in a document. You may see even more clearly how dysfunctional things are. Do you want to forgive him for cheating on you and try to love someone you can never trust again? Here’s another question, what does a healthy, loving relationship look like to you? Walked in on husband this afternoon drunk after being released from jail last week on probation and court ordered a portable smart start device that he has to blow into 6 times a day, and a AA meeting a day. Well, he doesn’t really know where the smart start device is, and actually said that he feels it’s better he go to jail instead of being in VET court having to comply to all they want him to do to remain sober. He’s still hanging with the woman he cheated on me with.. he say’s she’s just a “drunk’ friend? I bent over backwards for him when he was picked up 2 weeks ago.. I shouldn’t have, and now he is facing jail again and for probably a long time. Now, I am truly left to care for our daughter by myself. My husband has selfishly dismissed me and our daughter again. This is the 6th relapse… 2 in one month! Patricia, get out while you can. Get help. Get support. What is this guy adding to your life? It’s time to move on. For your own sake and your daughter’s. What kind of a legacy do you want for her? P.S. If you keep doing what you’re doing (enabling him), nothing will change. Is this what you want?